LEARN THE POWER OF PAPER! REAL ESTATE NOTES CAN MAKE YOU MORE MONEY IN REAL ESTATE THAN TRADITIONAL STICKS AND BRICKS. and I founded NoteSchool to help investors like you learn a whole new dimension of real estate investing. I’ve taught thousands of people the amazing earning potential that comes by owning the note instead of the property. I’ve been teaching this for years, and I’m offering a class that will open up huge potential for your short and long term earning potential. Because when you learn more, you earn more! No matter what area of real estate investing you do now – rental properties, flipping houses, or whatever – learning the money-making potential of notes will make you a smarter real estate investor in whatever you do. Many students soon refocus their investment strategy once they learn the many advantages of owning the note instead of the property. Imagine if you could avoid the headaches of real estate investing but keep the profits. And instead of getting one payday from a deal, imagine getting dozens for years to come. That’s what this class will teach you how to do! Many of our students have a real estate background, but many of our students have no real estate investing experience at all. Well, this is the class that will help you get started the smart way. And we’ll teach you how to get started with very little start-up money. In my 37-year career, I've purchased over 40,000 notes. When you combine the experience of my entire NoteSchool staff, we’ve been involved in over $3 billion in discounted real estate mortgage notes. This class is like looking over our shoulder to see how we do it on a daily basis. We train and mentor new investors, and we love introducing seasoned, savvy investors to a whole new method of making money. If you’re already a real estate investor, you’re no doubt aware that the inventory of potential investment properties is drying up. But the inventory of notes to invest in is booming! Here’s your chance to learn how to jump into the next stage of your career. We’ve been in the note business a long time, so we’ve seen trends and cycles come and go. Back in 2010, real estate properties to invest in were cheap and plentiful. But not in 2017! Today, the big investment opportunity is not in owning properties, it’s in owning notes. As I like to say, the 2017 note market is comparable to the 2010 REO market. PERFORMING NOTES: Where regular payments are being made on the mortgage. NONPERFORMING NOTES: Where payments have fallen behind but big profits are still possible. A note investor who doesn’t know the ins and outs of these two types of notes is like a carpenter who can’t frame in a house. You have to know what you’re doing and why you’re doing it. Both Performing and Nonperforming notes have the potential to bring you great returns on your original investment. And now I’m offering a class where you can learn the fundamental skills needed to make money from both types of notes. Each type of note has its own skill set to master for you to be successful, and we cover these specific skills in this POWER OF PAPER class. But many of the skills overlap and can be applied to either type of note. And since the goal of buying a Nonperforming Note is to turn it into a Performing Note, and you’ll learn about both in this one awesome class. "That's why I am writing to you today..."
My name is Eddie Speed and I've been waiting for a market like this all my life. What I've been describing to you is the non-performing notes market - a market I've been working for 34 years. You see, non-performing notes is nothing new. They've been around since people first borrowed money to buy a home - and stopped paying. If you're looking for a way to secure properties and cash flow at incredible discounts, non-performing notes are quickly becoming the only game in town. The subprime crisis has fueled my business to new heights. And it's done the same for plenty of my students. It can do the same for you too...when you understand how to get on the 'inside'. How do you do that? How to evaluate what any note is worth just like a seasoned note buyer. And when to pay 70¢, or 80¢, or 82¢ on the dollar. Why the Performing Note industry is a massive untapped opportunity! How to find good quality real estate in nice areas, not war zones, for as little as 70 cents - or less - on the dollar. How to be a “Deal Architect” to create notes, buy existing notes, and structure cashflows. How to negotiate the perfect deal to give the seller the price they want while you set the terms you want. How to get started by leveraging other people’s money. How to negotiate and structure performing note deals for maximum profit. Fee income strategies to connect a note seller to a buyer to collect and make an immediate fee. A secret strategy that allows you to use just $100 of your own money to get started. How to sift through dozens of potential deals to identify the best deals. The three things to watch out for: Blighted property, taxes, and title. Types of liens, lien positions, junior liens, and tax liens. The advantages you have over the big banks who are eager to unload these notes. Why Wall Street and large hedge funds have scooped up 97% of the deals, but how you can tap into their inventory. How to understand the foreclosure process and use it to your best advantage. Better yet, you’ll learn Win/Win strategies for how the lender and borrower can forego the necessity of foreclosure. How to get possession of a property at 35% to 50% of its "as-is" value that you can then turn around and sell for big profits – or use to create a healthy cash-flow. For only $14,000, you create a monthly cash flow of $373 for 30 years! You get a total of over $120,000 in profit. Tom gets to stay in his home. If you do it right, the $14,000 you invested could come out of your self-directed IRA - making all of that profit tax-free. In this deal, you're the bank, not the landlord. Tom is buying the home from you and you have no more need to take care of a leaky toilet than any other bank does. You've created a re-performing note. You've modified the loan so that Tom begins making payments again. Become a landlord and rent it out. If you've been in real estate for any length of time, you know what to do with the property when you get it... the trick is knowing how to buy a $70,000 property for only $14,000. "I have learned that you can start your own business with little money and achieve great success. I am proof. We've purchased over $3 Million worth of defaulted debt in the past 9 months and feel that we can double that number very soon. This is an exciting, profitable business, but the best part is that you can make money while changing people's lives for the better. Hat's off to Eddie, I couldn't have done it without you!" Stories like that from from Justin really touch my heart and make me proud to work in this wonderful business! 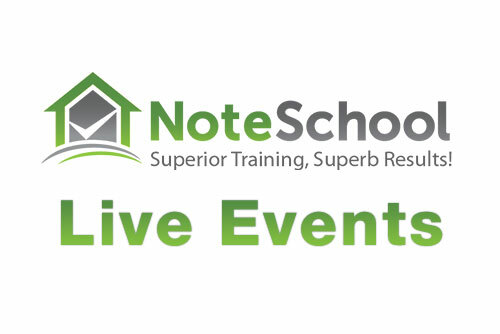 Note School's Power of Paper 3 Day Live Class! 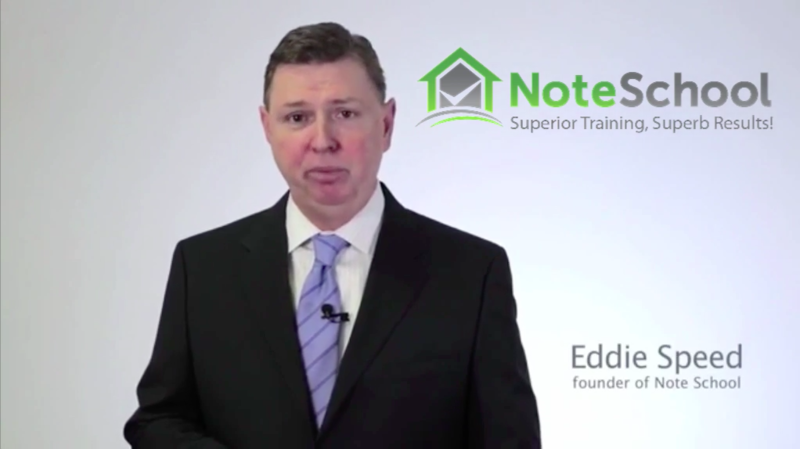 Here's a glimpse of what this live class is all about... the Power of Paper 3-Day Live Class is highly advanced training for the non-performing notes industry. The great thing is... we start at the beginning and work up to the really advanced stuff over the course of 3 days... so even if you're a complete beginner to real estate investing, you'll have no problem keeping up. Along with my team, I'll show you exactly how to buy real estate at 20 to 50 cents on the dollar... and you'll buy only good quality real estate in nice areas, not war zones. I run my Power of Paper 3-Day Live Training a dozen times or more each year, in cities all across America. So you might be lucky enough to have one close to where you live. They are totally worth flying for and plenty of people do just that. It's also potentially tax deductible, so you get to "double dip"! How to set your note business up so that you can do all of the work yourself to increase profits – or even better... none of the work, so you spend your days analyzing deals and making money. How to set up and use a self-directed IRA account to do your note investing so you can build a note empire and retire rich and tax-free! How to use my team to invest in many cities across the nation remotely – you’re in business for yourself, but not by yourself. How to sell a turnkey rental property PLUS owner financing,for a whole lot more profit. Learn the art of creating seller-financed notes to both local and out-of-town investors. How to use money from your IRAo get your first note under your belt. You won’t have to give any of your profits to Uncle Sam...and it’s perfectly legal. How to use your children’s education fund to invest in notes just like an IRA account. Learn about all the various types of note servicing vendors who can make your life much easier. How to have multiple exit strategieswhich allow for huge creativity to bring big profit upfront AND big cash-flow on the back-end. How to attract money from passive investors looking for investments so you don’t have to put up all the money yourself. How to hire a third-party to collect money or handle a foreclosure if it ever becomes necessary. How to structure the paperwork correctly so you’ll never have to worry about the many legal issues that can arise when you don’t. How to set up a marketing program to attract the right deals in your area, because it’s always better to have these deals coming to you rather than the other way around. Learn a full range of turnkey financing strategies. We’ve taught thousands of new investors who have gone on to become very successful. They’re also happy to share what they’ve learned with you in several real-life case studies. Not every single student will have the same results, but we’ll examine several lucrative real-life case studies of people who applied the same, exact skills you will be learning in our classes. Successful note investors realize they are in the problem solving business. This case study shows problem solving and creative deal making while combining both non-performing notes and re-performing notes. Tim was able to profit on this transaction because he was able to solve the property owner’s problem. The lender was selling this note because it had become a non-performing asset. The property owner fell behind on the payments and accumulated a $16,249 arrearage. Even though this property owner hadn’t made a payment in over 3 years, he indicated he wanted to stay in the home, but the bank simply wouldn’t work with him on a loan modification. He had what we call “emotional equity” in the property. Tim recognized this emotional equity and came up with a solution to the property owner’s problem. He modified the loan by extending the term and moving the arrearage account to the end of the loan. The new loan terms lowered the property owner’s payments by $123 per month. Once the note was re-performing, Tim sold 82 payments to an anxious money investor and kept the balloon payment and arrearage account for himself. See the exact breakdown of the deal below. It’s important to understand, these kinds of case studies are not the rare exceptions… they happen frequently! When you learn to think creatively with a goal of helping others at the same time, the potential for success is unlimited. This groundbreaking 3-day POWER OF PAPER Class gives you everything you need to get started buying and selling both kinds of notes right in your own backyard, with very little competition. Let me sweeten the pot a little... when you register today, I'm also going to send you the recordings of a previous Power of Paper Class. The recordings are very similar to the Class you'll be attending but with some differences too. I could sell these recordings separately for at least $500, but I don't. I keep them for Power of Paper 3-Day Live Training attendees like you. I know you’re going to be super impressed with our faculty, our training, and your fellow students. We always have an engaging class environment where questions are welcome. You’ll have the chance to mingle and interact with likeminded people who can share their wisdom and experiences with you. It’s a community where people are eager to share their own successes and struggles to learn from each other. Once you’re in, you’re in! We’ll keep you continually apprised of the latest updates in rules and regulations coming down the pike to give you an early leg up on the competition. We also keep you notified well in advance for upcoming industry events so you can get your reservation in early. Everything I’ve described so far lets you know this is a great learning opportunity. But let me sweeten the pot a little... When you register today, I’m also going to throw in huge BONUS. You’ll get free access to the on-demand, home-study curriculum of previous note classes. It’s a total of 26 modules – my famous Rich Rewards in Real Estate, and Big Money from Bad Debts. This includes the workbook and videos that you can study whenever it’s convenient for you to review to pick up on any details you may have missed. Whenever our NoteSchool faculty teaches, no two classes are exactly the same. We’ve discovered that our students learn best when we go deep into the case studies. Discussions evolve naturally so all questions are covered off. By listening to the audio of previous classes, you'll get the best of both worlds... a recap of the training plus even more true-to-life case studies. There's a ton of material to digest at every class. You have the opportunity to review the on-demand curriculum at any time – to answer any nagging questions, or to cement your learnings. I could sell each class training separately for at least $1,000... but I don’t. I only release them to attendees like you. If you’re still on the fence about attending this event, here’s something to help you make up your mind... MY QUICK ACTION TAKER BONUS! I recognize that for some people it can be a little scary getting started. Or maybe you just want some help creating your plan. Either way, you'll be thrilled to know when you register for this 3-day POWER OF PAPER Class, you'll get a 30-minute 1-on-1 session with one of my handpicked trainers to discuss your unique situation. We can use the time to discuss anything you'd like. But make no doubt about it, the idea is to move you down the path to buying performing notes quickly. This FREE strategy session will help you do just that. ALL THIS AT A GREAT, LOW COST! A full 3-day live training class where I, and other successful investor instructors, will share everything you need to know about investing in both Performing and Nonperforming Notes. The added bonus of free access to the on-demand, home-study curriculum of previous note classes: Rich Rewards in Real Estate, and Big Money from Bad Debts, including workbook and video that you can study whenever it’s convenient for you to review to pick up on any details you may have missed. A gift certificate for a 30-minute 1-on-1 training session where we'll help you create your strategy, so when you get back home you can hit the ground running. So... what’s all that worth to you? This class training has been sold successfully at $2,000. And the information it contains is worth at least double that. Access to the on-demand curriculum is worth another $2,000 by itself. And the 30-minute 1-on-1? Easily worth another $500. That’s a total of $4,500 in value... much more when you consider the deals that it’s going to help you put together. You can register today for only $997! This could very well be the best investment you ever make! This price doesn’t compare to the kind of money you can make buying and selling notes. Plus, many students can deduct the fee from their taxes, but please check with your accountant to be sure. YOU CAN EVEN BRING SOMEONE AT NO CHARGE! For that same small investment of $997, you can bring a spouse (or blood relative), or a legitimate business partner you’re already in business with at NO CHARGE! You’re investing less than $500 each to learn a business that can literally make you millions over a lifetime. Seeing as how you AND your spouse or business partner can both attend, that makes the overall value more like $9,000! IF YOU’RE NOT HAPPY, YOU GET YOUR MONEY BACK! As small as the investment is, I want you to be 100% confident in your decision to enroll. You may be worried that you’ll get to the class and find out that the note business is not for you. That’s why I’m pleased to offer you this impressive money-back guarantee. . .
We offer your complete satisfaction, or your money back! If you’re not satisfied within 30 days, simply let us know you’d like to be refunded, and we’ll be happy to give you a full refund, with no hassles! I have no problem putting myself on the line like that. Your satisfaction is the most important thing to me... and besides, I know our NoteSchool training works! As you can see... I’m the one taking all of the risk here. You have nothing to lose! I’m so excited to have you come to our live 3-day POWER OF PAPER Class. I look forward to meeting you there... and to adding you as the next case study in my successful student portfolio. See you in person soon! P.S. - I've done extensive research on this 'perfect storm' of non-performing note buying opportunity. I can say with absolute certainty it's a massive cash-cow, for once thanks to the banks and to Wall Street. Even better, it's not going anywhere for at least 5 years, but investors who get in now will reap the lion's share of the profits. That's what I want for you too. SIGN UP FOR THE CLASS NEAREST YOU! Enter Your Details Below To Reserve Your Seat. Acceptable Guests: Spouses And Business Partners. Act Fast - Live Training Event Spots Fill Up Quickly! Have questions? Feel free to call 888-980-9240 and speak with us!